The National Weather Service is projecting Southern Arizona's fire season to be more active than normal. "There's leftover dry fuels from last year, and there's newly formed fine fuels," Warning Coordination Meteorologist Ken Drozd said. 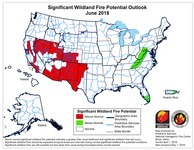 Above average daytime high temperatures, combined with storm systems bringing wind but no rain, and very dry conditions, are some of the reasons why the NWS projects May and June to have the more fire activity than normal. Due to a wet February, there is now more dry fuel in the region, according to Drozd. Sometimes, significant rain events leading into fire season can delay or shorten it, but that wasn't the case this year. "Those new grasses that greened up from that precipitation event have now dried out again, due to the warm temperatures we've experienced lately," Drozd said. "The hotter you get, the more you're going to dry things out. It just keeps things dried out unless you get some intermediate rain that'll come in, and again, there's none in the forecast right now." Last year, fires ripped through Southern Arizona from April to July, blackening landscapes and destroying homes in their paths. People from communities all through the region were forced to evacuate, sometimes on multiple occasions. Assembling an emergency preparedness kit . Educating your family on how to use the Safe and Well website . Take pictures on a phone and keep copies of important documents and files on a flashdrive that you can carry with you on your house or car keys. Drozd is urging people be extra cautious, so they don't start a fire that could put people in danger. "If we don't have a lot of human caused fire starts, and we don't couple that with strong wind events that then fan those flames," Drozd said. 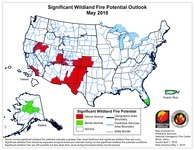 "It could make a big difference in how the fire weather season plays out."